Hello again! My apologies for the silence; I have been away on a language course in Germany for the last two weeks and got back at the weekend. Things have been all go this month between the music festival (which went really well!) and the course so by this stage I am very glad to be back to normality. 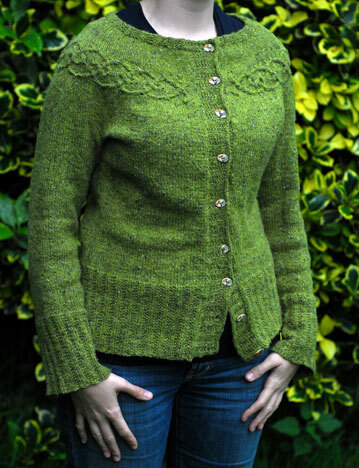 It’s the Scroll Lace wrap by Ysolda Teague from the August issue of Yarn Foward magazine. Mine turned out a good bit smaller than a wrap – really just a lacy scarf – but I love it because it is a perfect wee thing for Autumn! I will post a better, modelled photo to give an idea of the size when I block it out. There is a lovely picot cast off along the top which needs vigorous blocking out at the moment. It was a good choice of project for a few reasons. 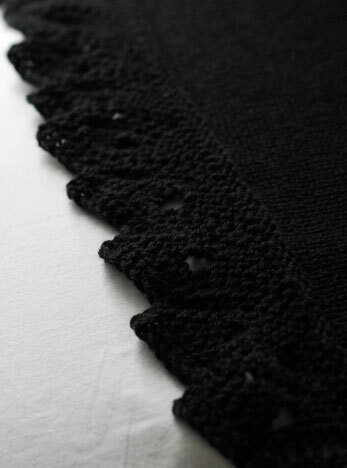 It is constructed by firstly knitting a long length of the lace pattern and then picking up stitches along one side of it for the main body of the wrap. Then you knit back and forth in short rows to create a wedge shape and finish with the picot cast off. Each step was easy enough to memorise quickly but demanding enough to maintain my interest. It was a small project to carry around, especially at the lace knitting stage. I didn’t knit on it every day but got in some long stints whilst watching the athletics on tv so in the end, I managed to eke it out for the two weeks. I finished it up last night. … which meant I had to cast on something new, right?! I made it to two different wool shops while I was over but didn’t buy very much. Some magazines and enough for a red hat were about the extent of it. The wool is ggh Giglio, a wool/polyamid blend and the pattern is the romantically-named #15 from the latest Rebecca. This is your basic 1×1 rib floppy beanie. After the initial rib it develops into a yo/k2tog pattern which gives the main part of the hat extra flop. Easy enough and good tv knitting. Things have been all go lately. I decided last February that it would be great fun to organise a chamber music festival in my home town in Co. Sligo. I really missed playing with other people and figured that putting on an event was as good a reason to get together as any. I applied to Sligo Arts Office for some money to rent a piano and they were generous enough to provide me with enough to ensure that the project could go ahead. I came home last week and have been busy printing posters, tickets, ringing people, rehearsing, practising… I have woodwind friends coming to stay for a few days before the concerts so that we can rehearse together so things have been busy! I will post more details later. Of course, being me! Shortly after I got my rejection letter from Mannheim, I started researching other courses only to discover that the very thing I was looking for is provided in DIT. Apparently it is only kicking off this year, which explains why I didn’t come across is during my initial search. After a flurry of emails, I was told that if I got my application in lickitysplit, I could audition in early September with a view to starting in mid-September. So, I spent the weekend getting my application together and got it sent off yesterday. But enough of shop talk! Here’s what you really want to see…. The pattern is Henley Perfected from Interweave Knits Winter 2007 and I’m using Rowan Calmer that I got for half price in Lola Rose in Galway. I love the yarn! It is so soft and the matt finish really took me by surprise. It really goes the distance, too – I am nearly finished the back and only cracked open my 4th ball last night. The only modification I am making is by working the body in the round. It is written to be knitted flat but really, life is too short for such things. However when I came to the three lace panels (front left, back and front right) I couldn’t get it to work right. I counted my stitches and I counted them again. I tinked back and reknit the foundation row. Nope. All wrong. Tinked back again and recounted again. Reknit the foundation row. All wrong again! At this point I gave in and went to bed. The following morning over my second cup of tea I realised my error pretty quickly… there is no point trying to knit the back lace panel according to the right front chart and expect things to turn out right! In other news, I have been on a veritable knitting rollercoaster during the last week. I was cruising Ravelry, being nosy and looking at prolific designers’ personal projects, when I came across a spectacular pair of mittens. The pattern came from an old Finnish mitten book by Eeva Haavisto. Hmm, I wondered if I could get it online. The more I researched it, the more amazing patterns I came across that had been knitted up from it and the more disgustingly out of print it was! Anyway, to cut a long, convoluted story short, I have ended up securing a copy that a friend of a friend of my brother in Finland found in a box. There will be more about this when I eventually see it in the flesh! This will be the last one for a while! 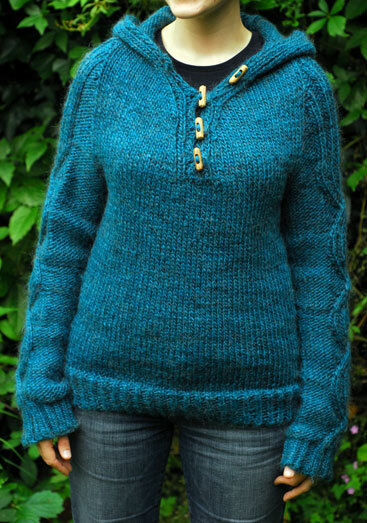 I finished this up in the middle of Winter and it quickly became one of those sweaters that could do no wrong! 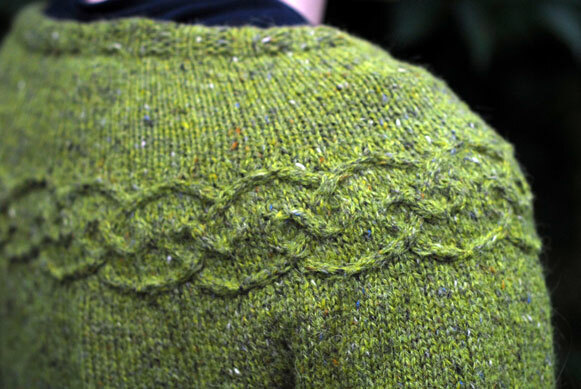 Pattern: Green Gable, Pattern #28 from Vogue Knitting, Fall 2008. Needles: 7mm Knitpicks and DPNs for the sleeves. I didn’t bother going down to a 6mm or 6.5mm for the hems and cuffs. Yarn: Brown Sheep Lamb’s Pride Bulky, 7.5 skeins for the 36 1/2″ size. As you can see, it was the back and sleeve detail that really caught my interest. The shape of the hood was also interesting to knit – more like a sock with some short rows. 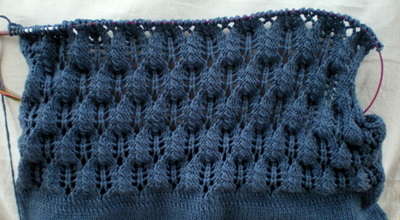 The sleeve cabling is very similar to that on the back and continues right up over the shoulders. I really like the neckline, too, as it provides the ventilation you sometimes need in such a heavy jumper. Overall the pattern was fairly straight forward to work from, despite a few blatant errors in the cable chart. 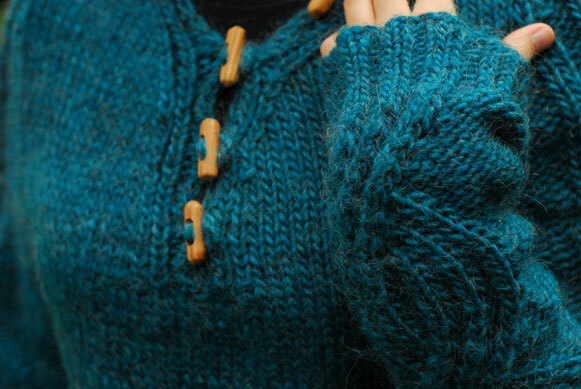 If you’re looking for a quick knit with a good amount of interest, this is definitely it. I think it would work quite nicely without the hood as well. This one is almost a year old! I just never got around to taking photos of it. 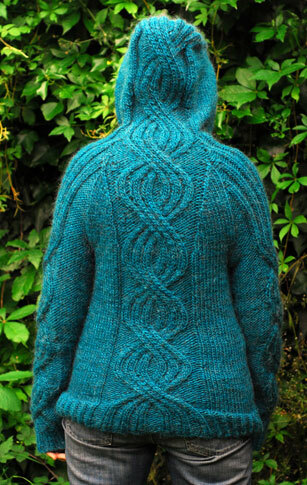 Pattern: Tangled Yoke by Eunny Jang, from Interweave Knits Magazine. Yarn: Felted Tweed by Rowan, about 8 balls. Needles: 3.5mm. This is a funny one. If I recall correctly, 3.5mm is in or around the needle size called for. However, I needed to go down to a 3mm to get gauge… but I didn’t want to get gauge! This is because the pattern doesn’t accommodate a 36″ size. I did some sums and figured that if I knit the 34″ size with the bigger needle, I would fall somewhere between the 34″ and 38″ size. It worked! Modifications: Apart from what I’ve detailed above, I made the body and sleeves a good deal longer. I had to reknit the button band twice or three times – I’m still not 100% happy with how it lies but it’s ok most of time. I also knit the body and sleeves in the round. The pattern is a little convoluted in parts but overall was not too bad to follow. I don’t like how there isn’t a medium 36″ size but if you’re willing to put in a bit of work before you start, you can overcome that problem. The best part about the whole design is the marriage of a concept with the perfect yarn. 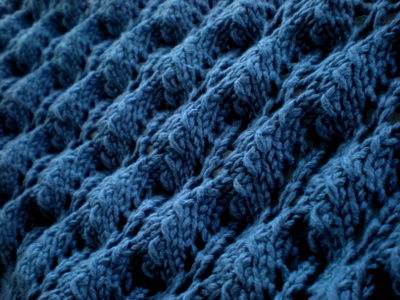 It can be difficult to work with tweedy yarn if you don’t want to just knit a plain sweater. Anyway, this has become a firm favourite of mine.